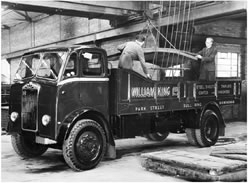 The origins of William King Ltd date back to the 1820’s starting out from a Gloucester ironmonger owned by Edmund Boughton. The business continued to expand during the nineteenth century to incorporate iron and steel warehousing, trading and tinplate production. By the 1860’s the business had operations in Birmingham, Gloucester and South Wales. In 1905, Edmund Boughton and Co Ltd sold its Birmingham business to Mr William King, the then General Manager, who died in 1917, after which the business was bought by Henry William Worley. 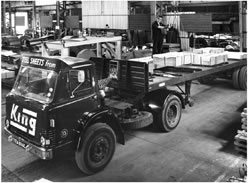 The operation continued on a sole trading or partnership basis until 1951, when the present limited company was formed. 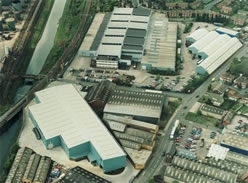 In the 1940’s, operations started in Sandwell, further expansion meant that larger premises were needed, and, in 1959, the Atlas Ironworks site was acquired. In 1962/63, the earliest parts of the now ‘Atlas Centre’ were constructed. Over the years continued investment has seen this site grow to over 25,000m² of covered warehousing and processing facility on a 5ha site, which includes the building of the ‘East Works’ in 1999, presently a 7000m² state-of-the-art processing facility, now incorporating four wide high performance press blanking lines. 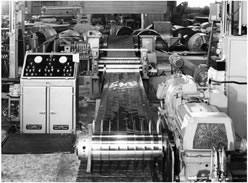 At Atlas Centre, we have three wide slitting lines (the newest being installed in 2017), two multi-blanking cut-to-length lines, three narrow slitting lines, four narrow cut-to-length lines, two lines for combining metal coils into composite blanks, four wide press blanking lines, a coil-to-coil polishing line and extensive associated equipment giving the company an unrivalled range of facilities on one site, serving the automotive, domestic appliance, construction and packaging industries throughout the UK and Europe. The range of materials includes Mild Steel, Aluminium, Stainless Steel, Tinmill Materials, and Pre-painted Materials. Our principal customers include leading household names in the automotive, domestic appliance, construction and packaging industries. Our company's products are used to manufacture cars, automotive components (including filters and exhaust systems), cookers, tumble dryers, microwave ovens, aerosols, office furniture, commercial lighting units, domestic boilers, bakeware, stationery and filing supplies, and many other products in the building and engineering sectors. In 1988, a commercial agreement was signed with Mitsui & Co plc, the oldest and largest trading company in Japan, to form a new company, Mi-King Ltd (MKUK), a JV steel service centre based in Washington, Tyne & Wear, UK. In early 2010, we acquired a further 35.1% of MKUK shares, so this company is now an 85.1% owned subsidiary company of William King Ltd. In 2005, operations started at our second Mi-King company (MKCZ) in Kolin, Czech Republic. Therefrom, we are supplying similar industries and companies related to our UK customer base. MKCZ remains a 50:50 Joint Venture with Mitsui. These operations have been extended and major new investments set in place, particularly regarding tinmill materials. In 2015, we commenced significant processing of aluminium, primarily for automotive applications. We have invested in a discrete aluminium wide coil press blanking line and in 2019 will be adding specialist vacuum stacking equipment to this line. Our three companies, William King, MKUK and MKCZ buy from the leading European mills and represent one of the largest flat rolled metals service centre operations in our industry. In 2017/18, the total sales from the three companies were approximately £235 million. We are replacing our Navision based ERP system with a new Microsoft Dynamics 365 system which will add important new scope to our IT facilities. Together with new report producing software, this brings our capability up to best international state-of-the-art standards. William King remains privately owned, and is thus able to take a long-term view of investment strategy. The company achieved, and continues to maintain, the ISO14001 Environmental Standard and the ISO TS 16949 Automotive Quality Standard. The Company remains committed to the training and development of its employees and is now widely regarded as the leader in the industry in terms of training, quality and environmental standards.